ISBN 0825634822. 9x12 inches. Book/CD Pack. 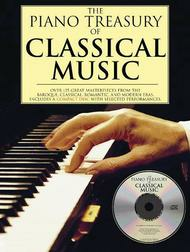 The Piano Treasury of Classical Music is designed to be the cornerstone of your personal music library. This tremendous piano collection contains 400 pages of great music literature, specially selected and edited for the pianist who loves classical music. No other single volume can provide the wealth of exquisite piano selections contained within these pages. Here you will find the world's favorite inventions, preludes, fugues, minuets, sonata movements, nocturnes, waltzes, mazurkas, intermezzos, romantic short pieces, impressionistic works, and light classics, as well as the most rewarding traditional arrangements of themes from the great symphonies, chamber works, operas, and ballets by the master composers of the past four centuries. One Heart, One Mind Composed by Johann Strauss Jr.
March 27, 2018 Yes, indeed a classical treasury! those songs selected, many are well known songs like Autumn Leaf and Dance of the Sugar Plum Fairies that are easily heard in many places and by different instrumentation. I would've been more than happy to pay a higher price and obtain more pieces--especially the ones that are harder to find and play on piano like "The Harmonious Blacksmith" which is great and contains the variations. The CD wrecks it in my opinion and leaves one very disappointed in the selection. If you don't care about the CD, you'll love the book. If you wanted the CD to help you learn, you might be very disappointed as I am.